Thank you so much for wanting to contact American Porta-Stor. We are happy to answer any questions you may have. 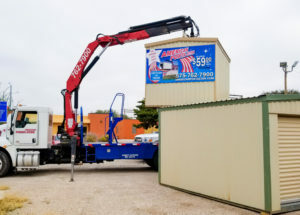 Our storage units are perfect for all your storage needs with two convenient sizes and the capability to be lifted above any backyard fence. We deliver them where you want it, when you want it, for as long as you want it. Let us deliver a storage unit to you! Please click the link above, use one of the methods below. We look forward to hearing from you. WE DELIVER Where you want it! When you want it! For as long as you want it!